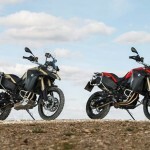 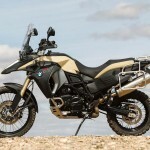 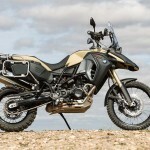 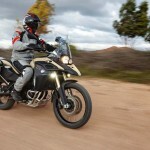 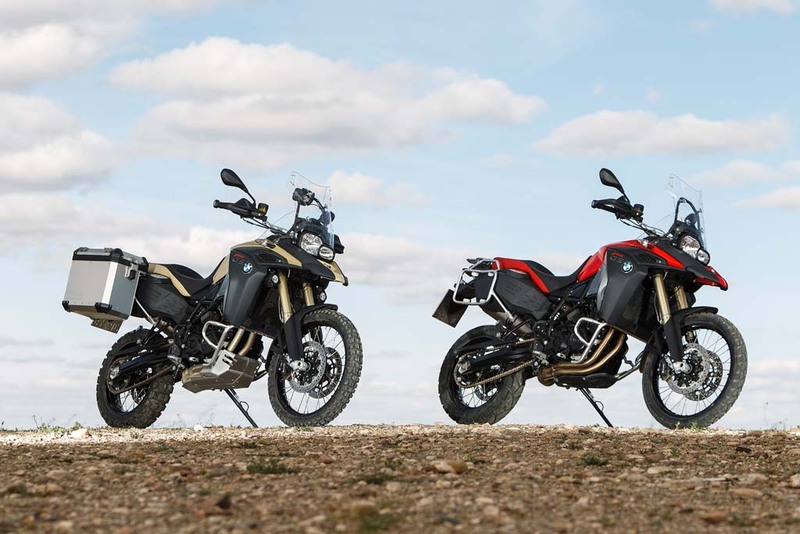 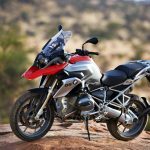 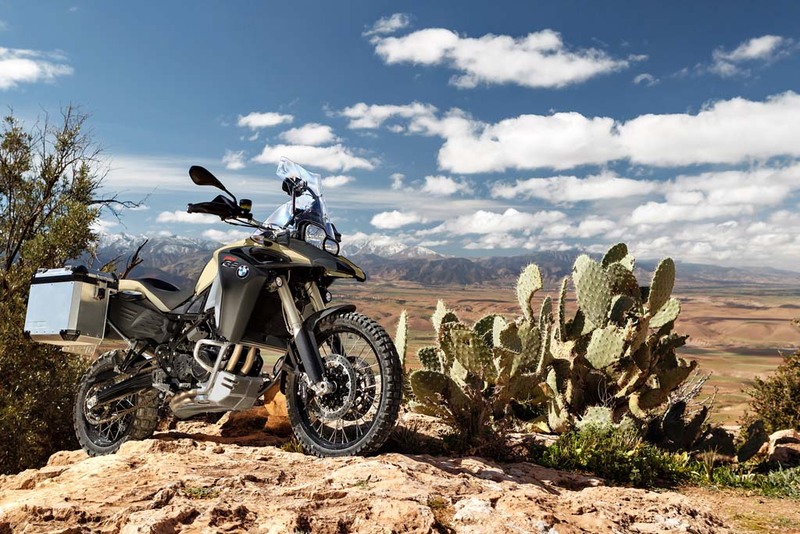 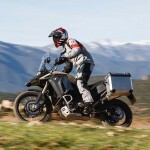 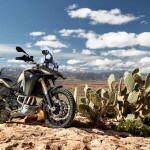 BMW has announced a new Adventure version of the F800GS, providing a more off-road-oriented version of the middleweight dual-sport. 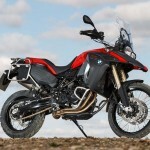 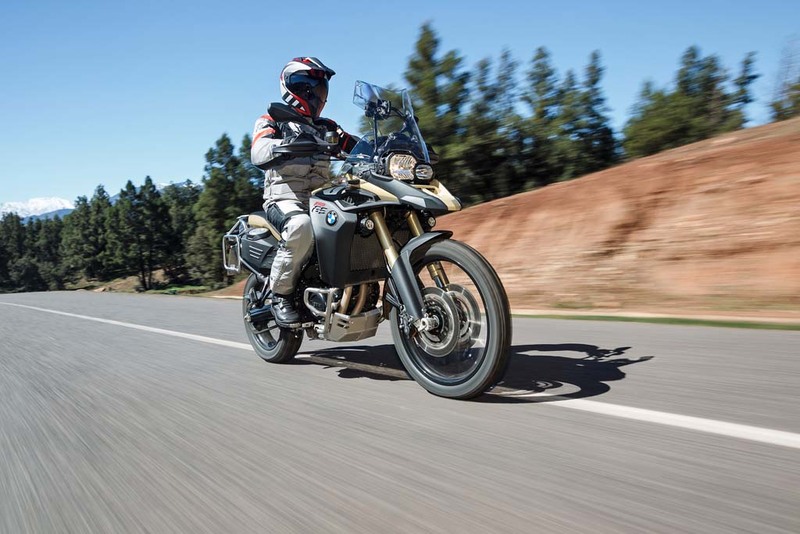 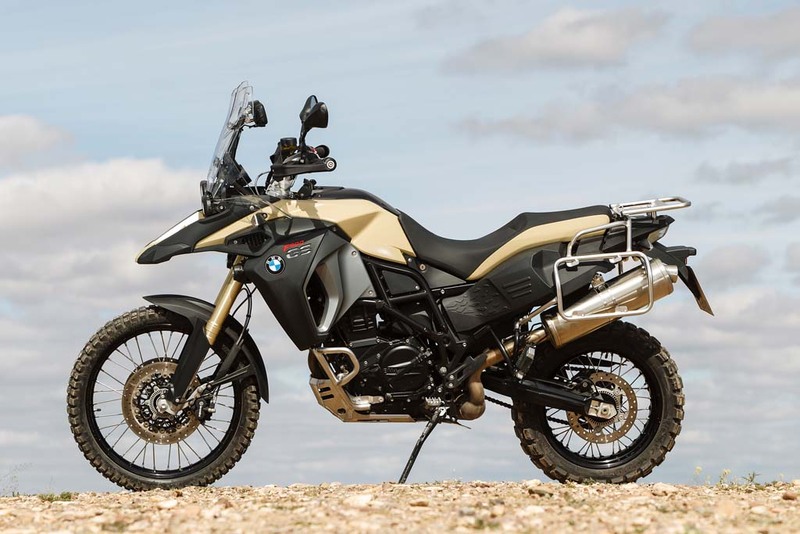 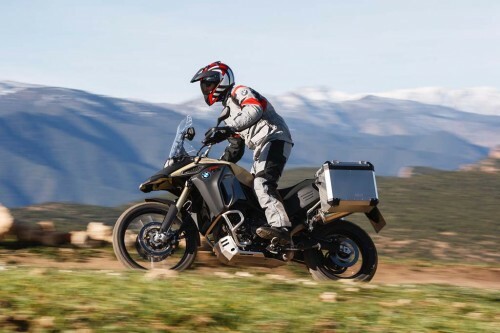 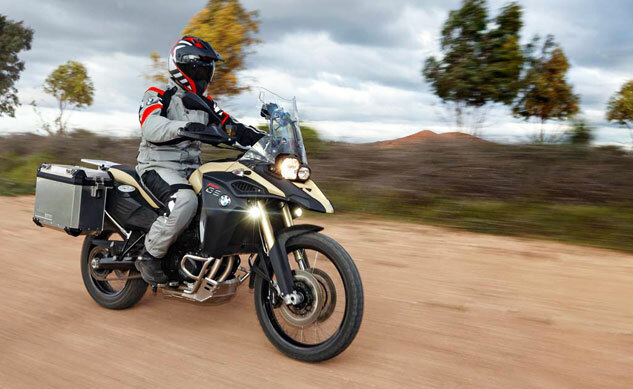 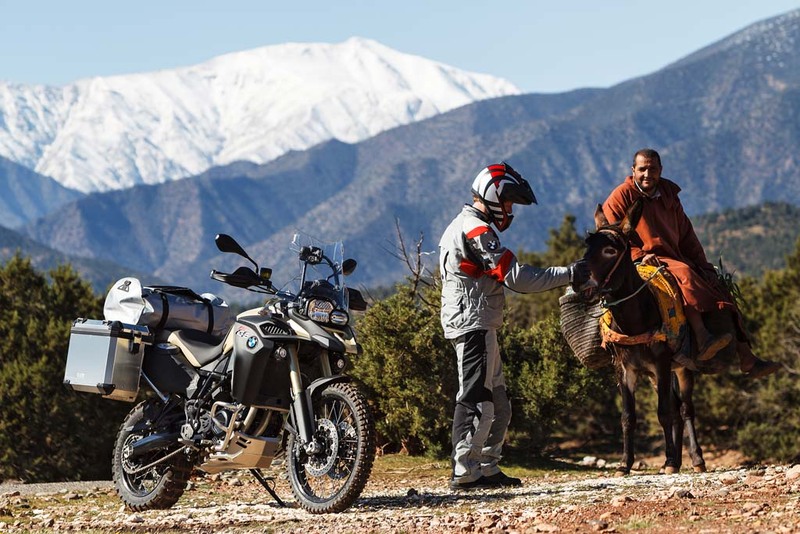 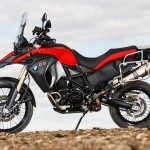 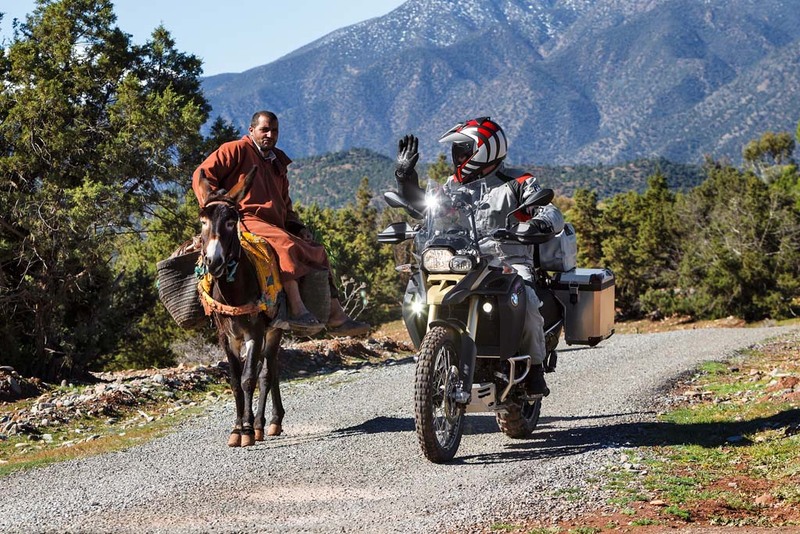 BMW has offered an Adventure version of the R1200GS for a while now but this is the first time BMW has done the same for one of its smaller GS models. 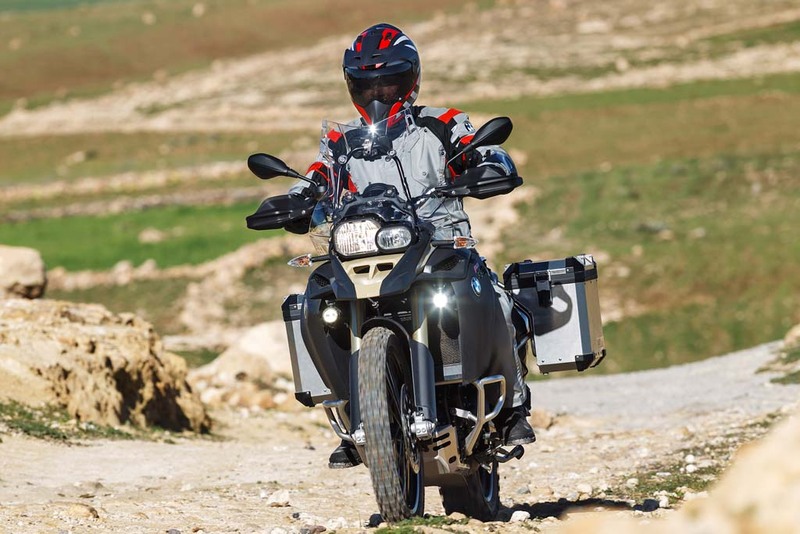 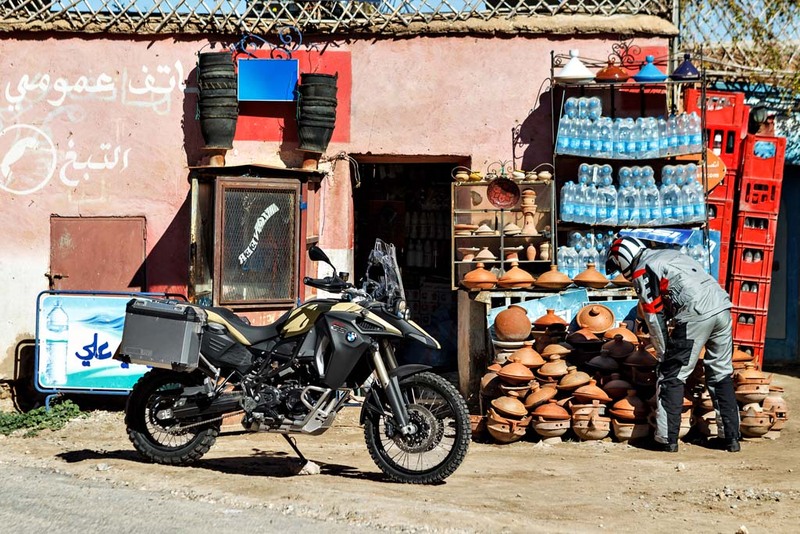 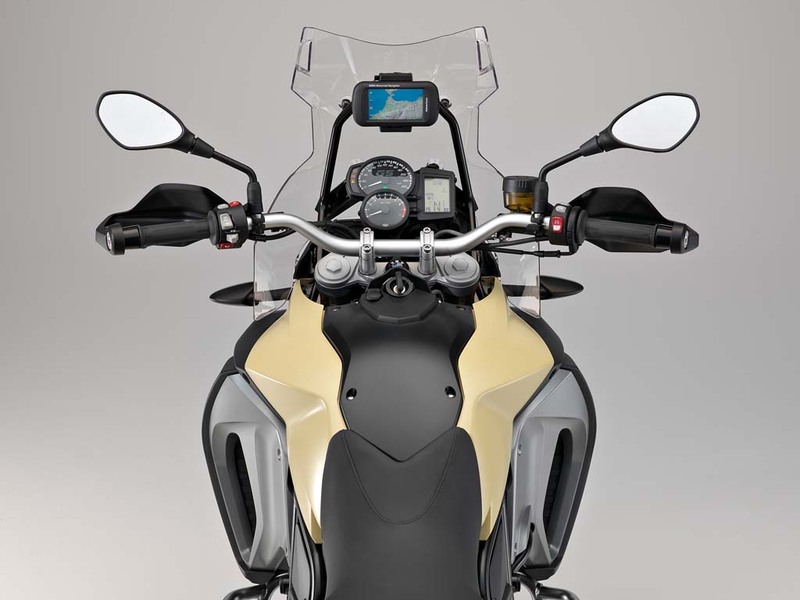 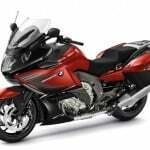 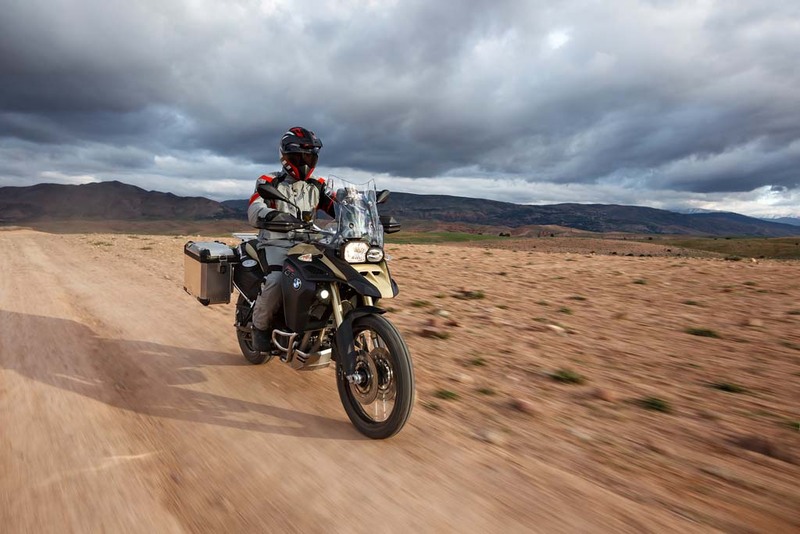 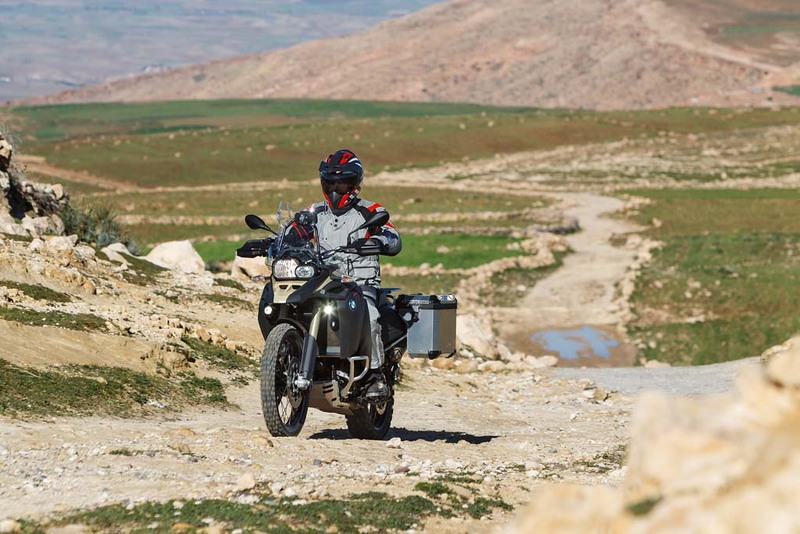 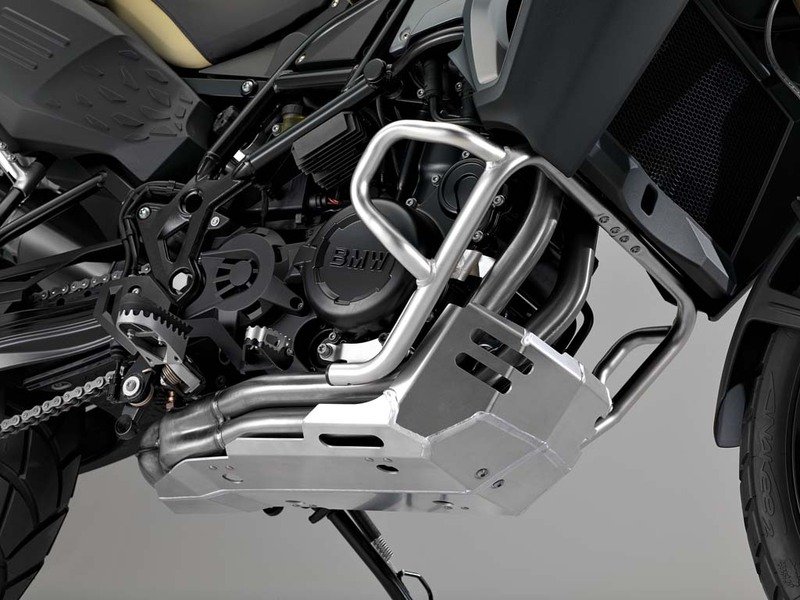 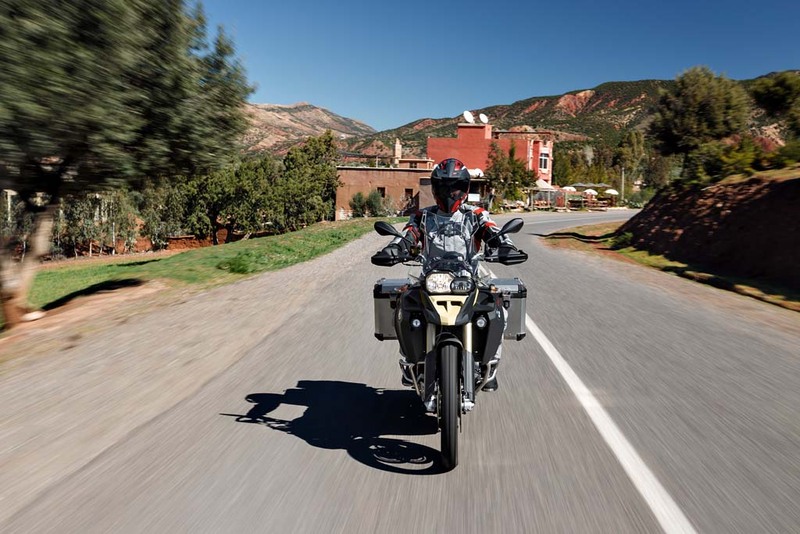 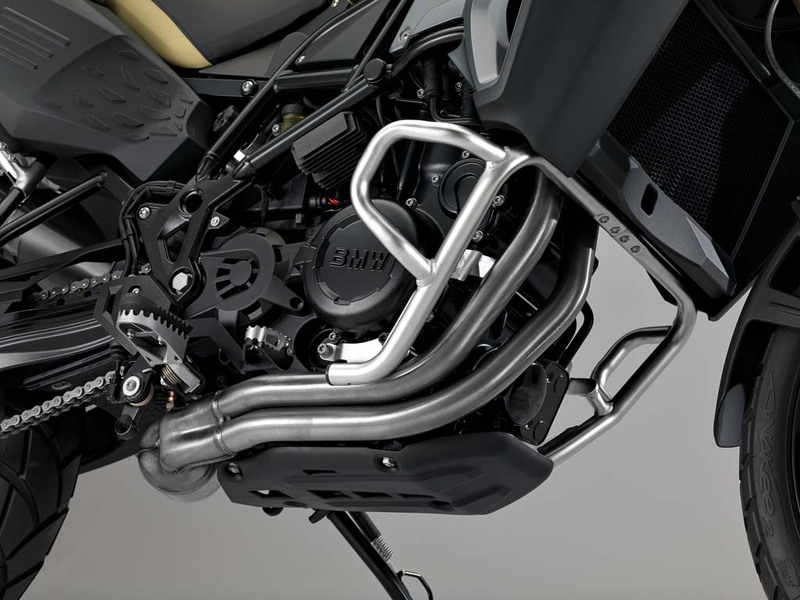 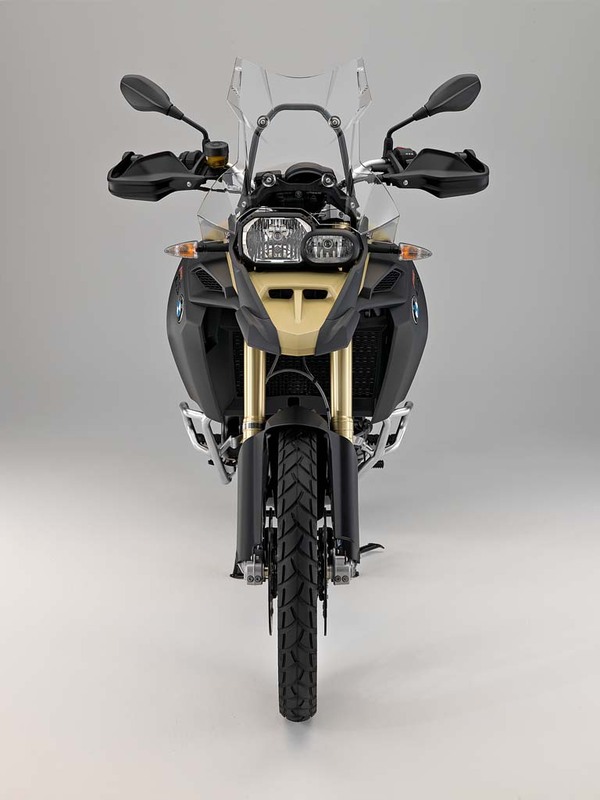 Like the base F800GS, the Adventure version is powered by a liquid-cooled 798cc four-valve parallel-twin engine. 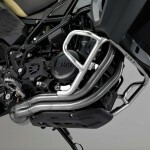 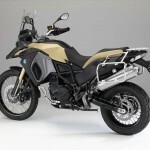 BMW claims a maximum output of 84.5 hp at 7500rpm with 61.2 ft-lb. 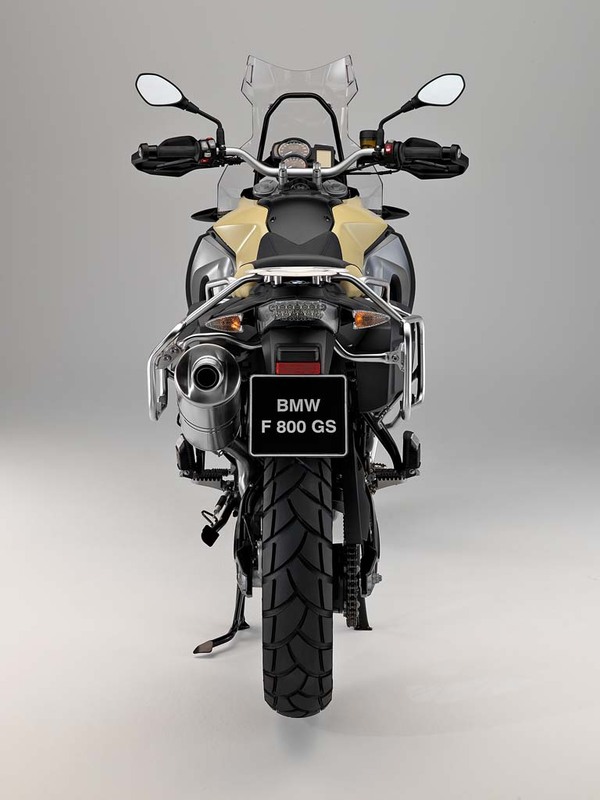 of torque at 5750rpm, identical to the base model’s claimed figures. 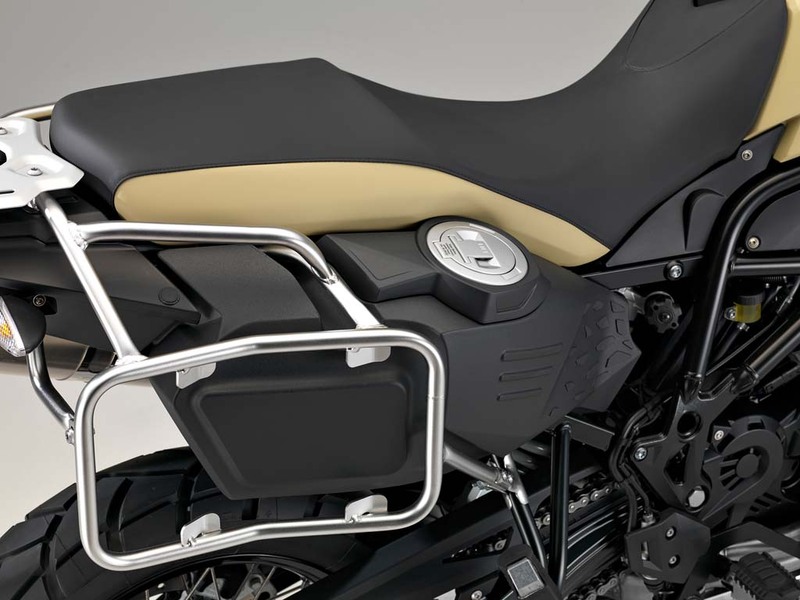 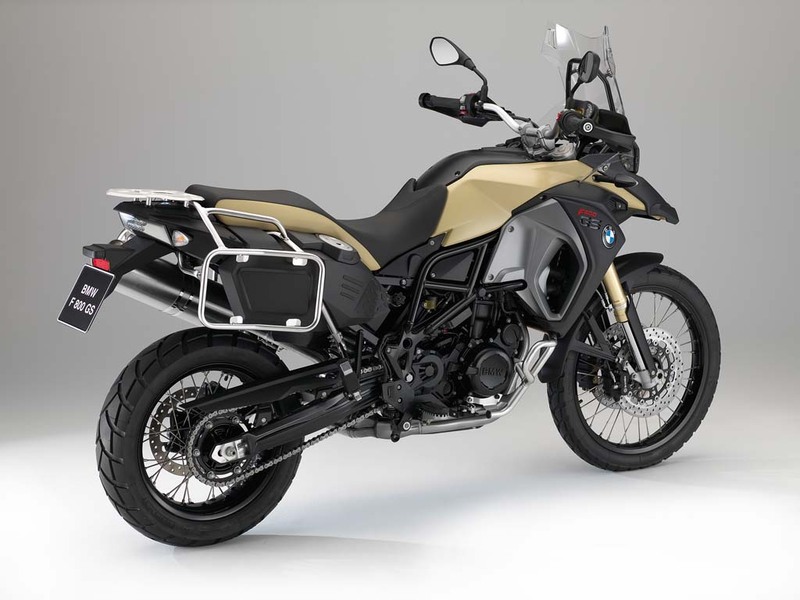 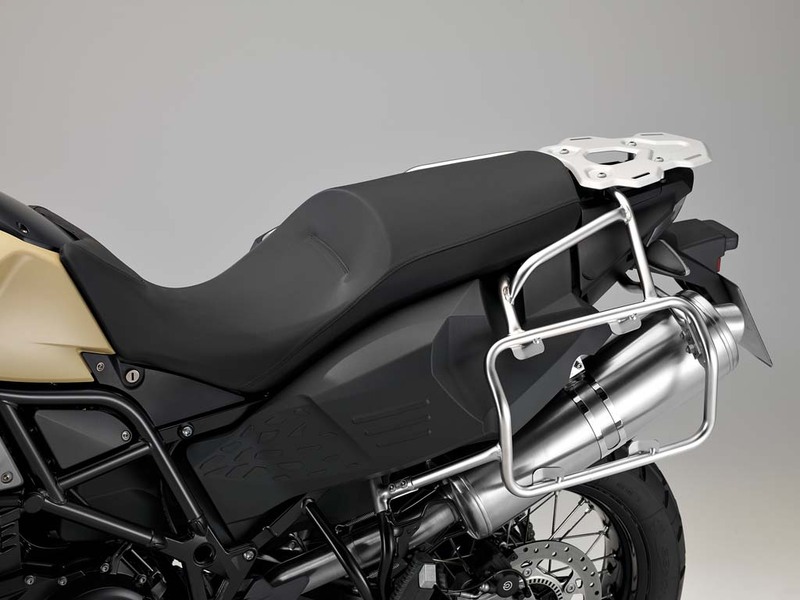 The tubular steel frame is also identical but the rear subframe has been modified to support the 6.34-gallon under-seat fuel tank which is 2.11 gallons larger than the base F800GS’ tank. 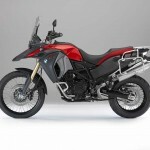 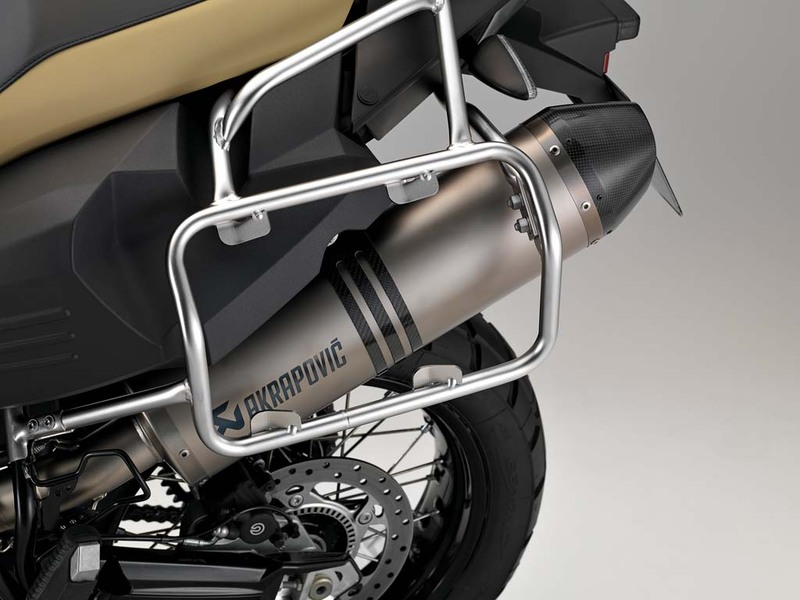 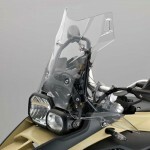 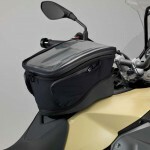 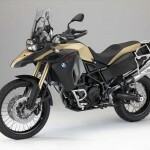 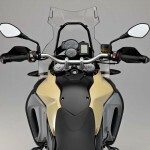 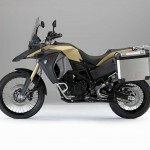 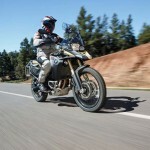 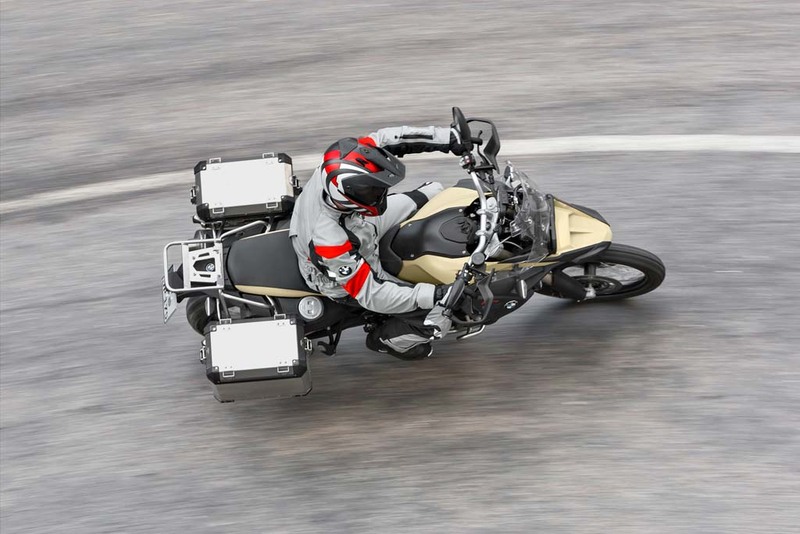 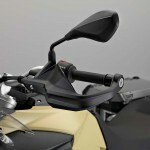 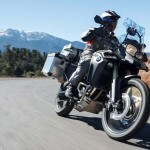 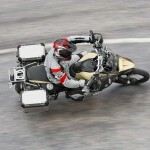 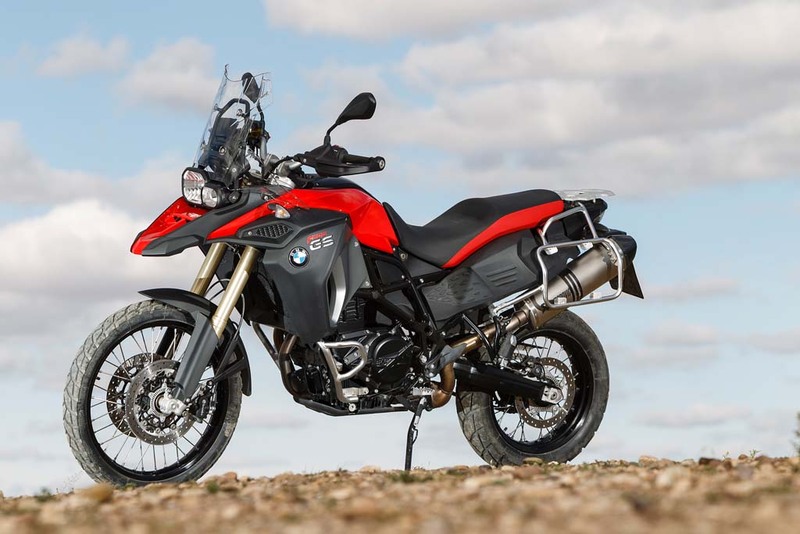 According to BMW, the larger fuel tank should increase the F800GS’ range by 75 miles. 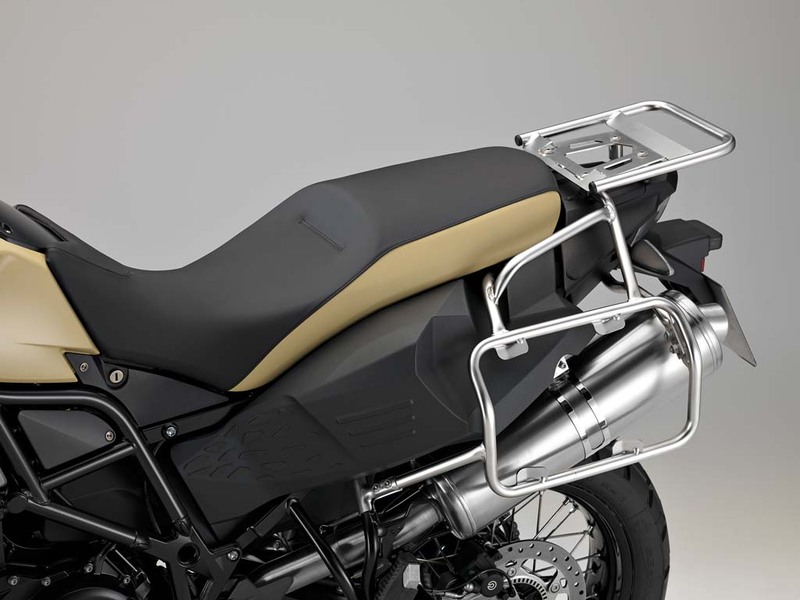 Other changes include GS Adventure styling, a new bench seat, a larger windscreen, hand protectors, wider footrests, an adjustable, reinforced rear brake lever, engine bars and a pannier rack which also provides protection for the fuel tank. 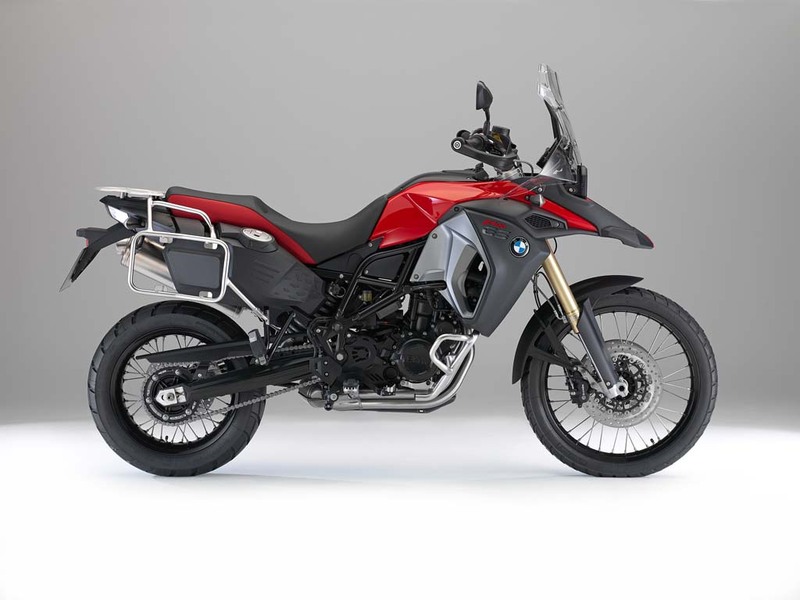 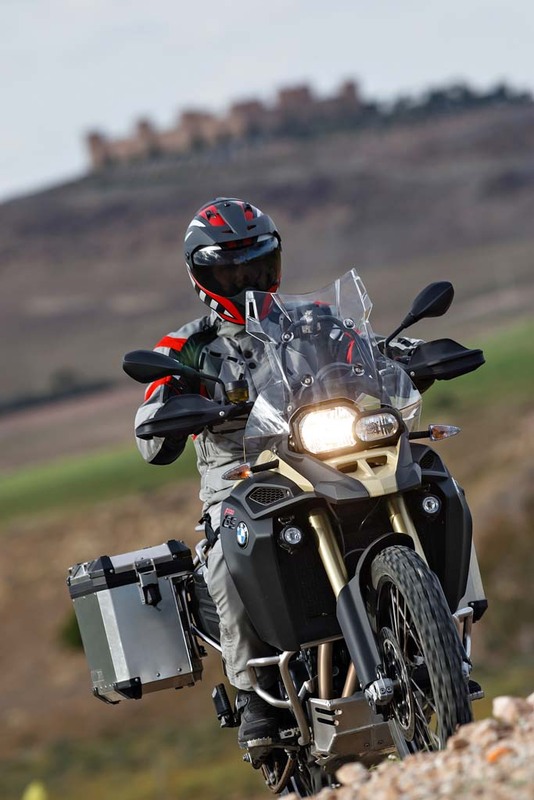 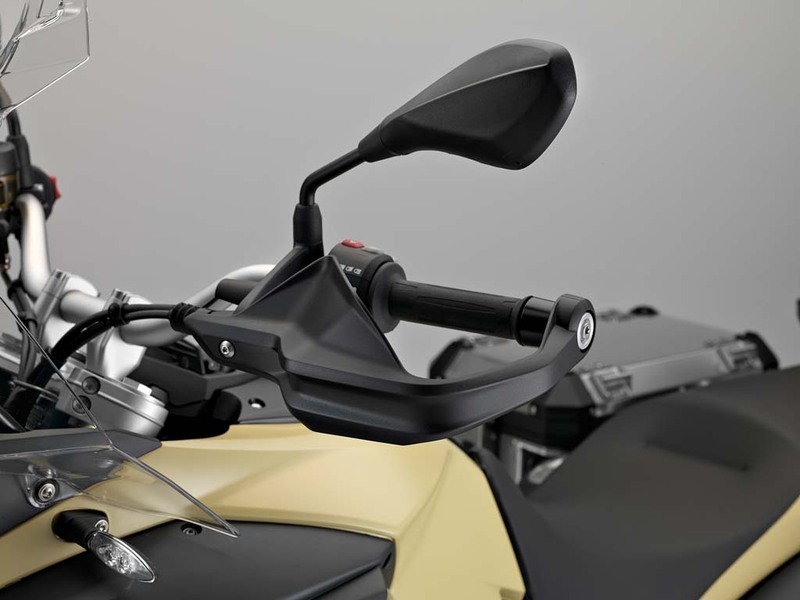 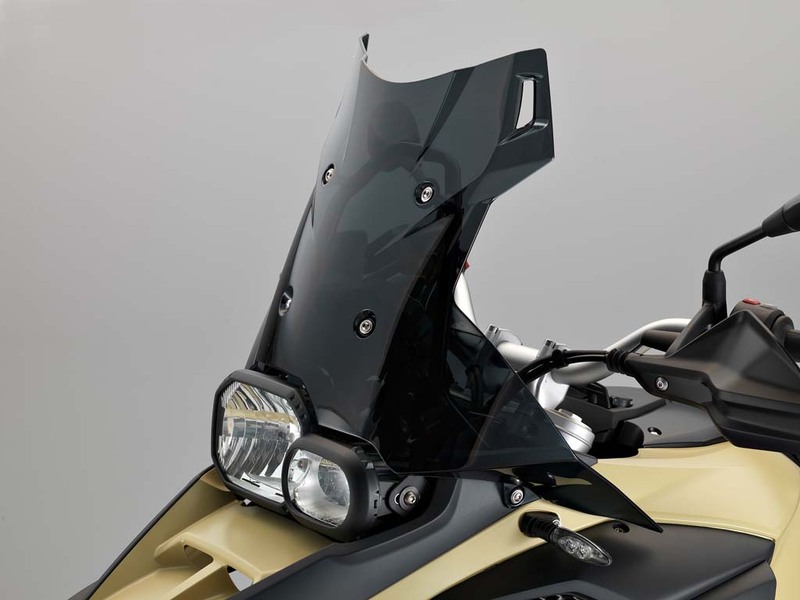 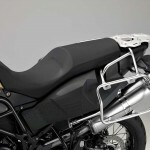 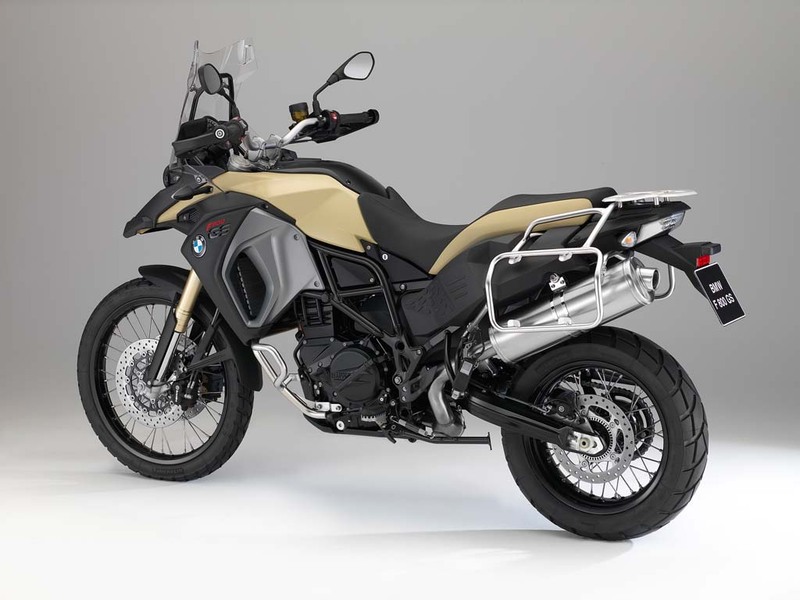 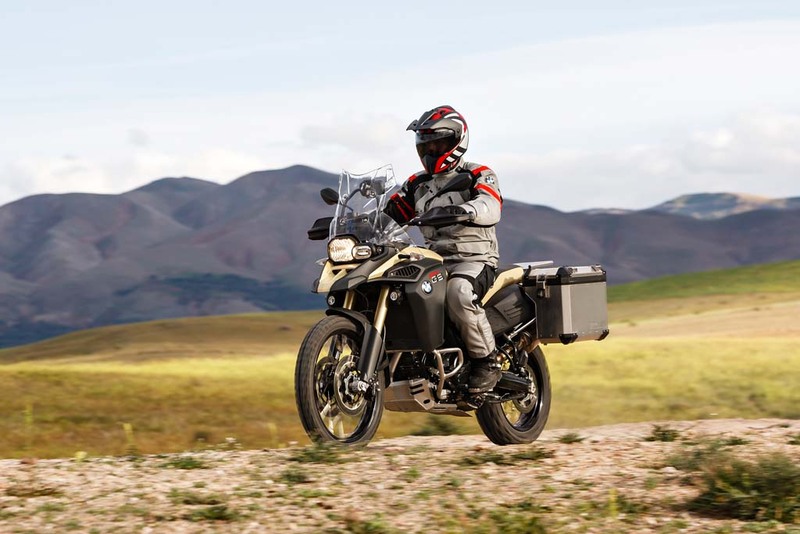 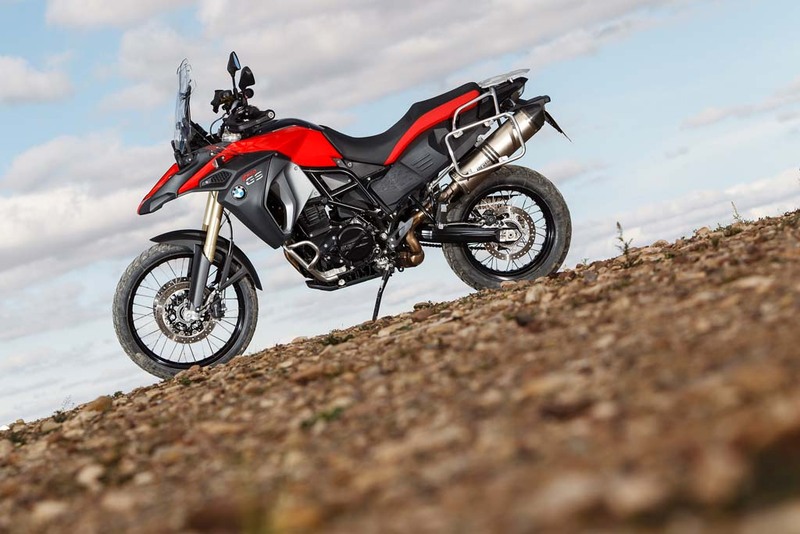 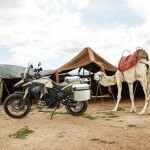 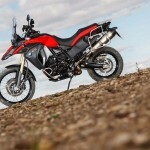 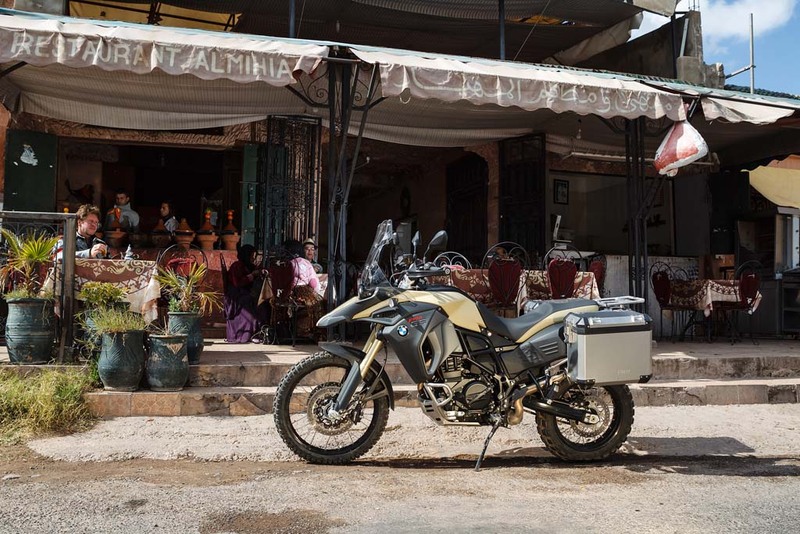 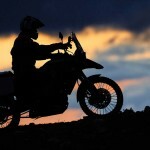 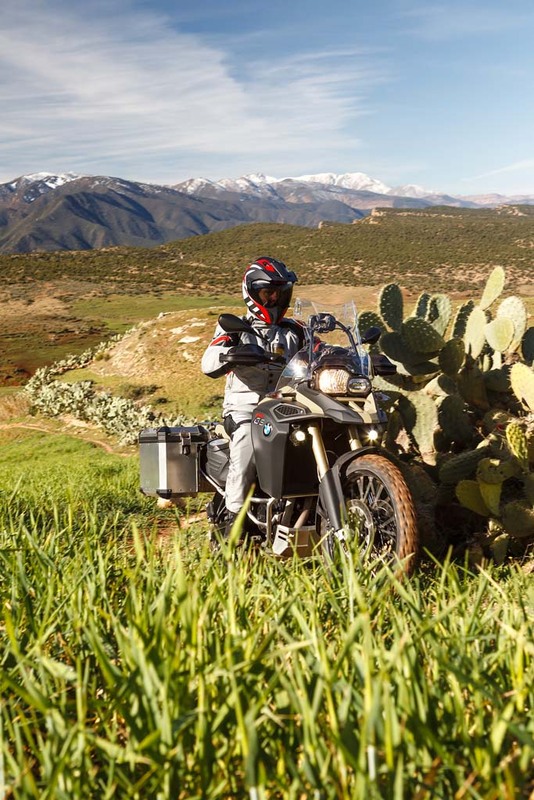 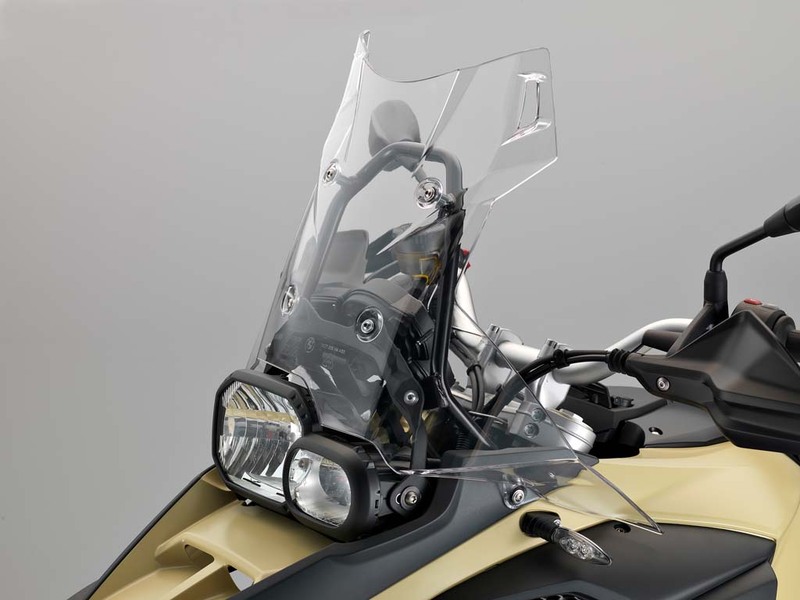 The Adventure model also stands taller than the base version, with a standard seat height of 35 inches a half-inch higher than the F800GS’ seat (the free optional low seat height option lowers the seat height by 1.1 inches.) 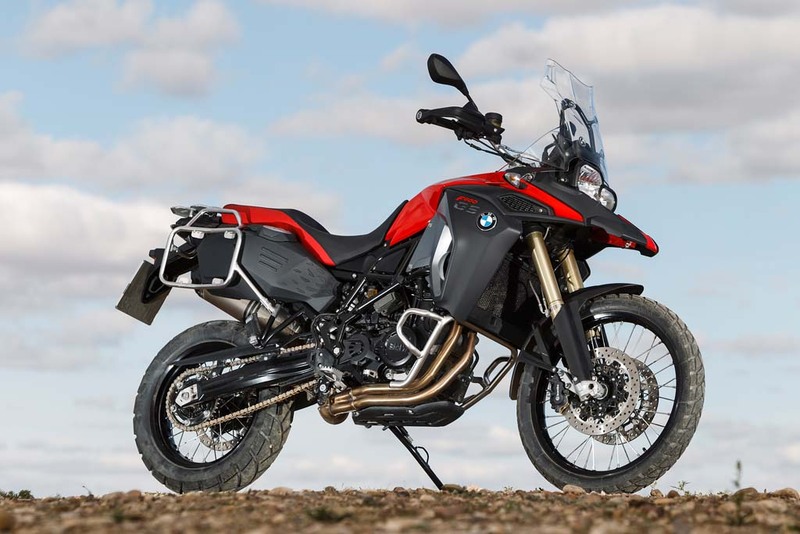 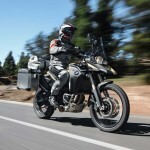 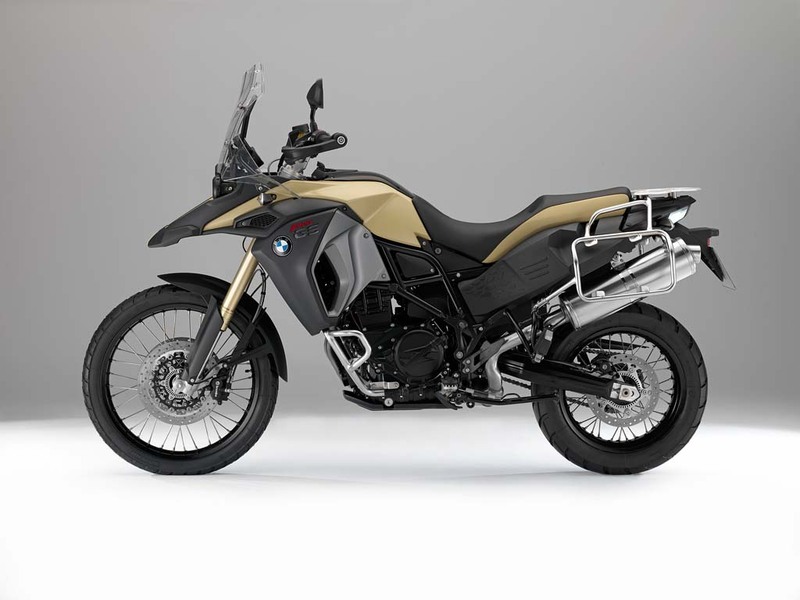 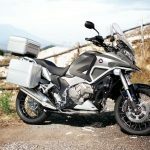 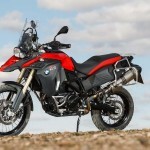 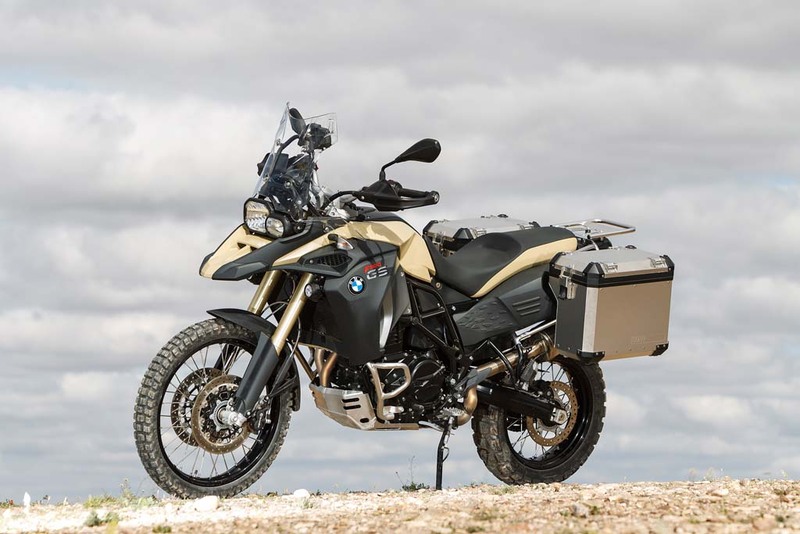 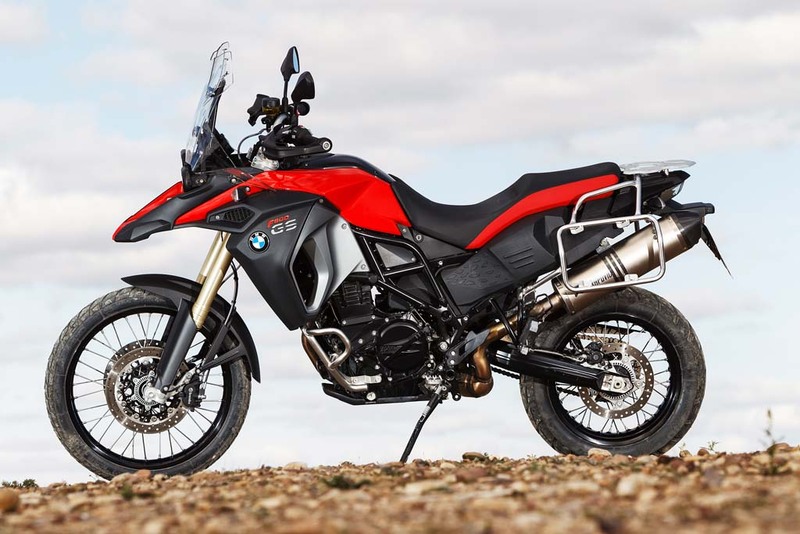 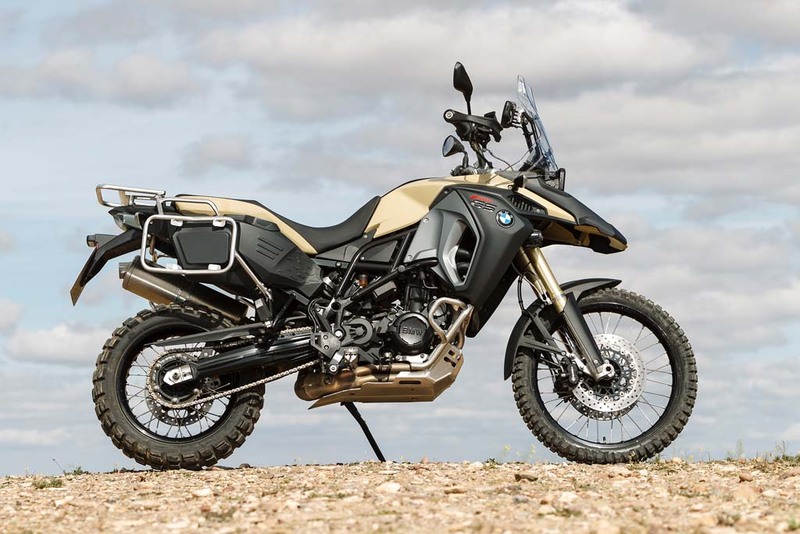 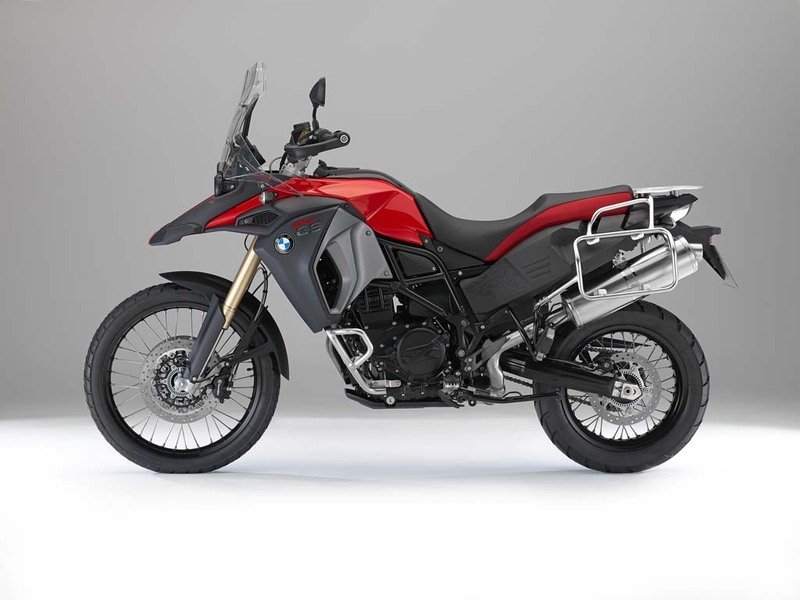 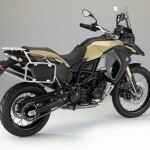 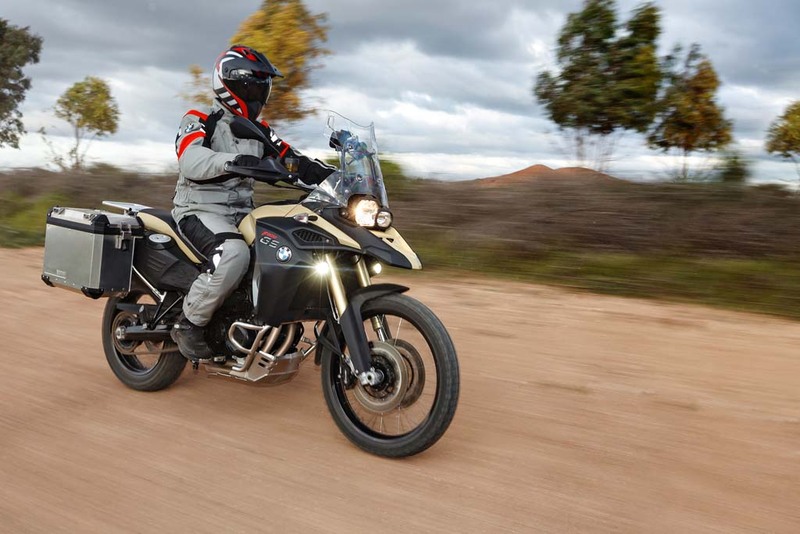 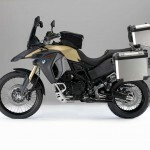 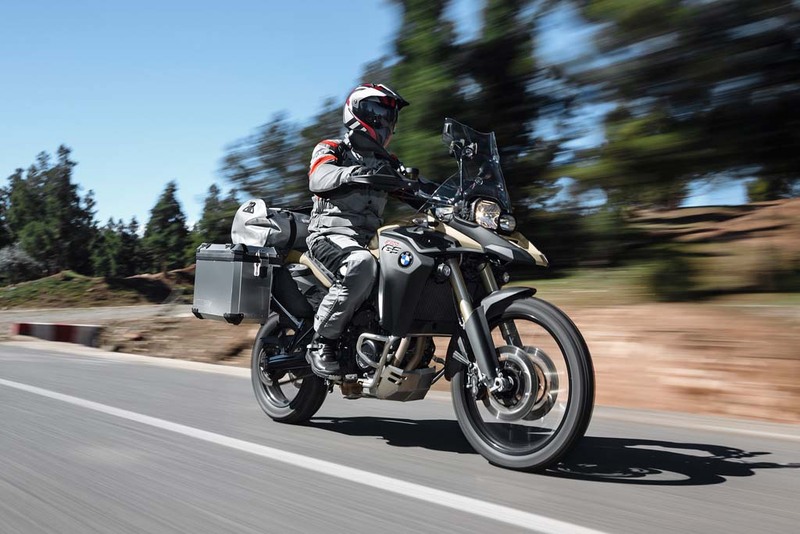 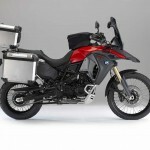 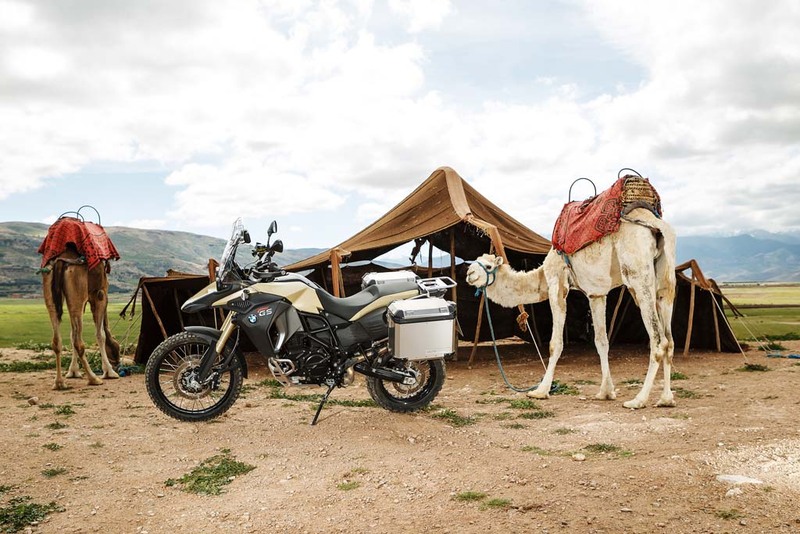 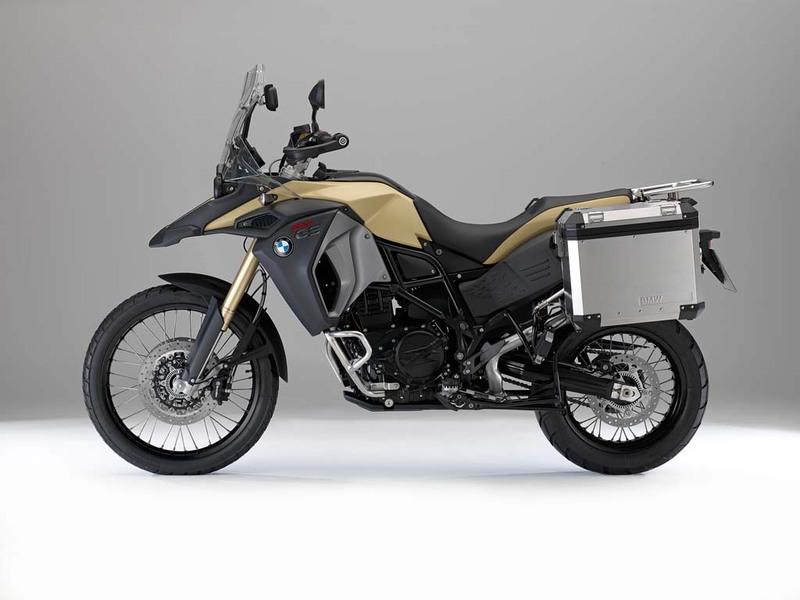 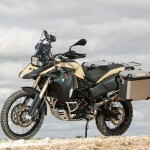 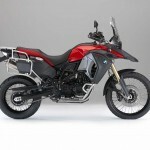 BMW claims an unladen curb weight of 504.8 pounds for the F800GS Adventure, making it about 33 pounds heavier than the base version. 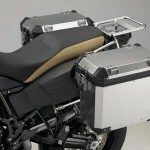 Like all current BMW models, ABS is standard equipment. 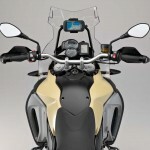 Available as extras however are Automatic Stability Control (i.e. 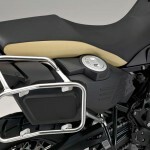 traction control) and Electronic Suspension Adjustment. 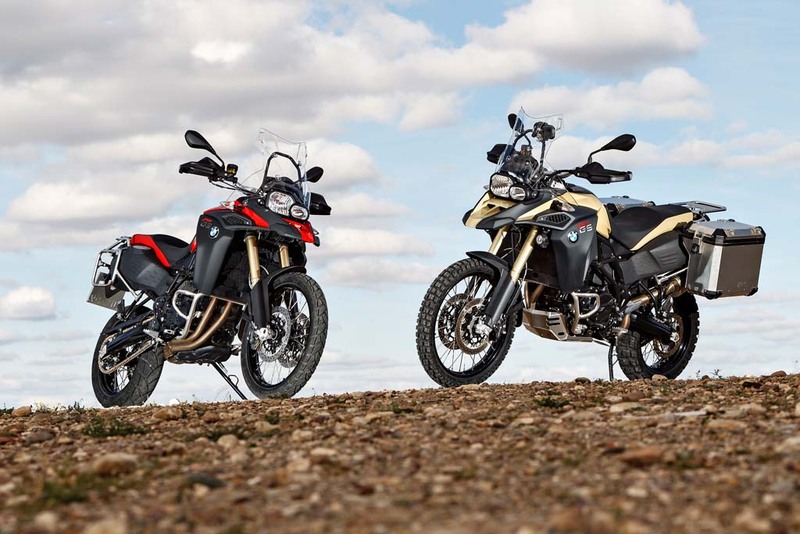 On models equipped with traction control, the F800GS offers an Enduro ride mode that lets the ABS and ASC allow for more slip for better acceleration and braking for off-road riding. 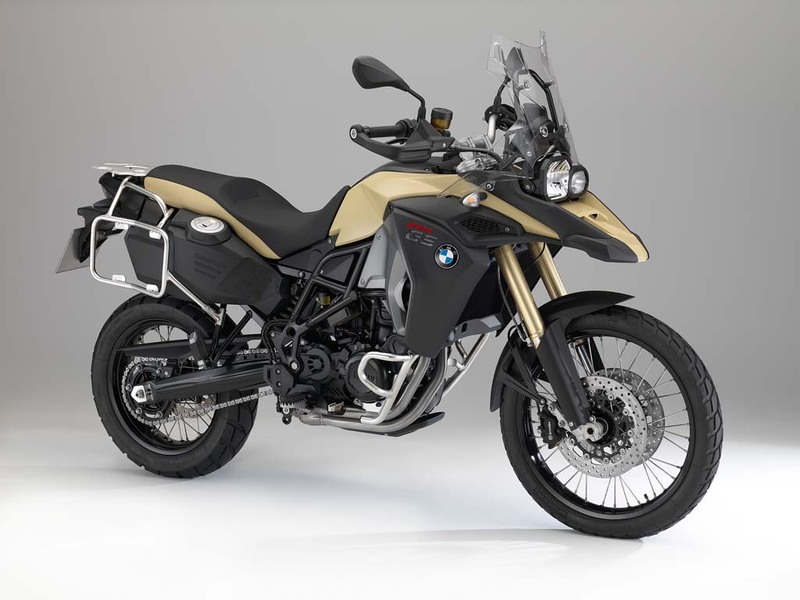 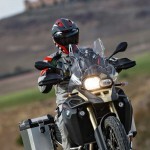 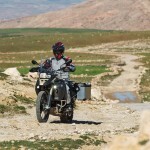 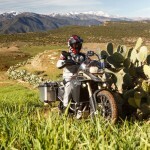 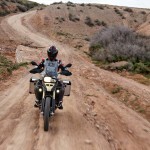 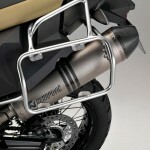 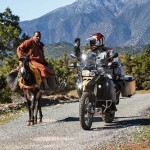 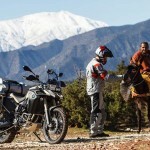 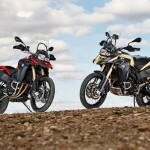 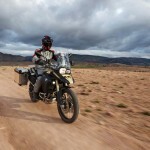 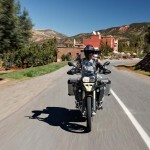 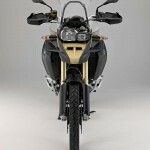 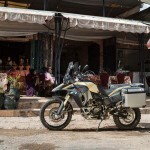 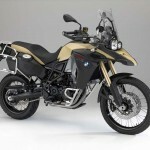 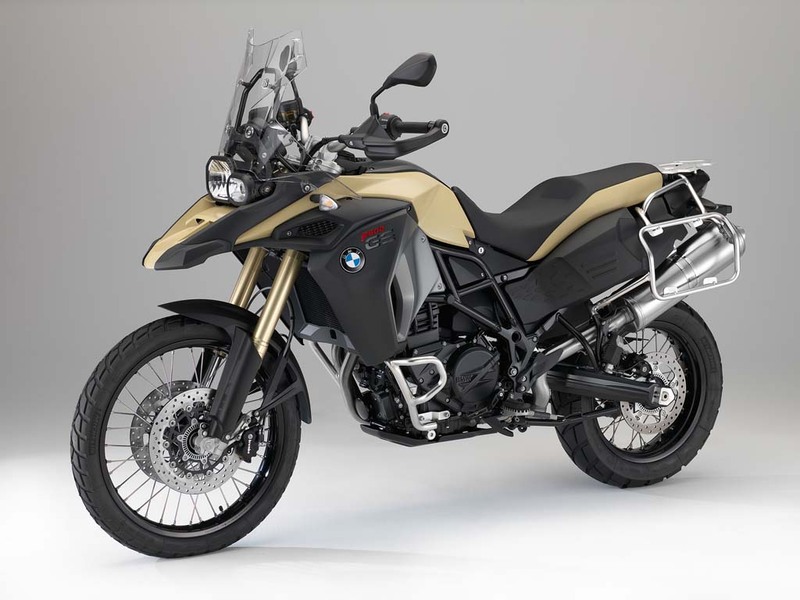 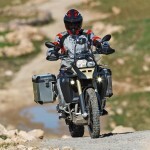 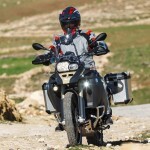 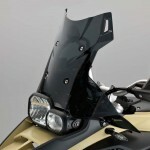 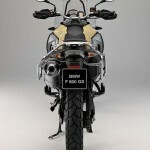 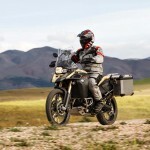 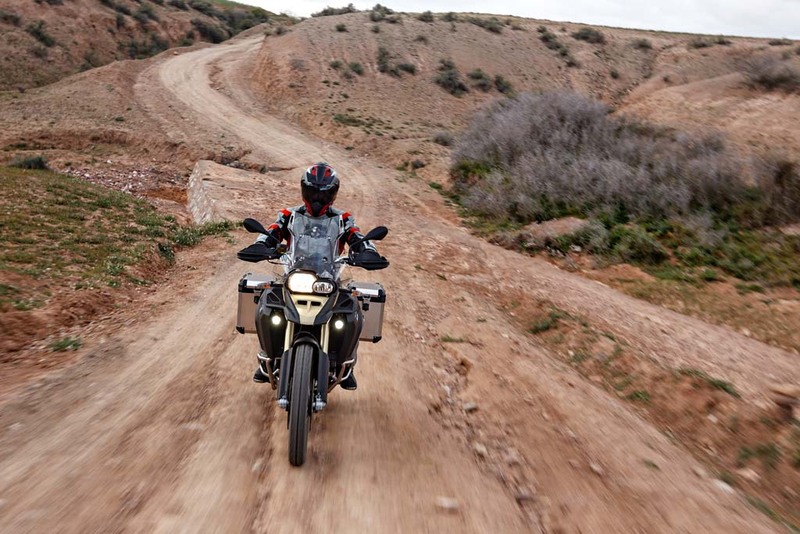 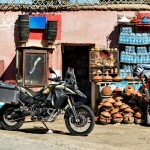 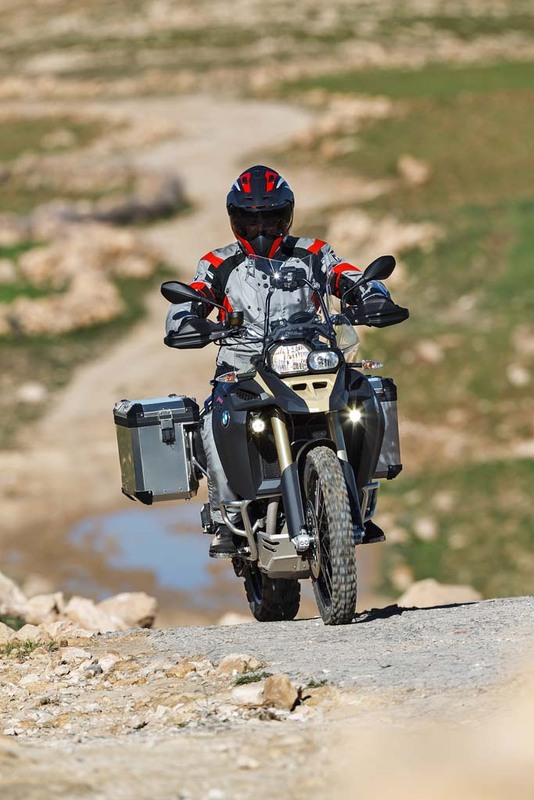 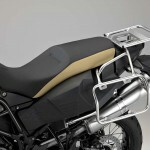 The first 1000 F800GS Adventure units will be known as “Launch Edition” models, featuring a Sandrover matt paintwork. 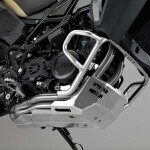 It will be available with three equipment packages. 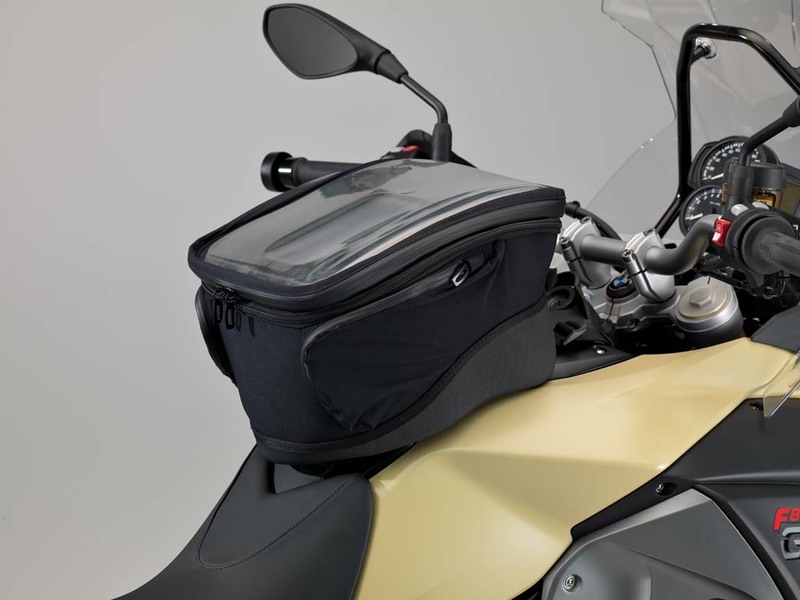 The Comfort package adds an onboard computer, heated grips and a center stand. 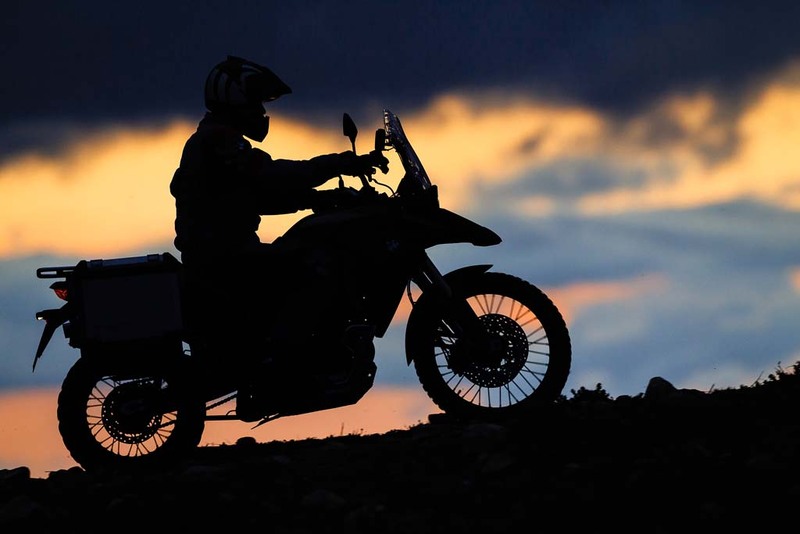 The Enduro package includes ASC and the Enduro ride mode. 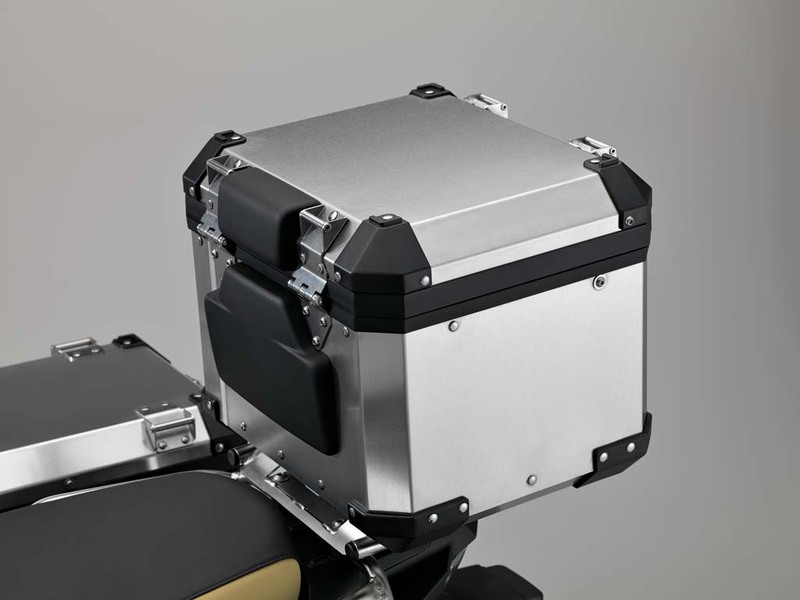 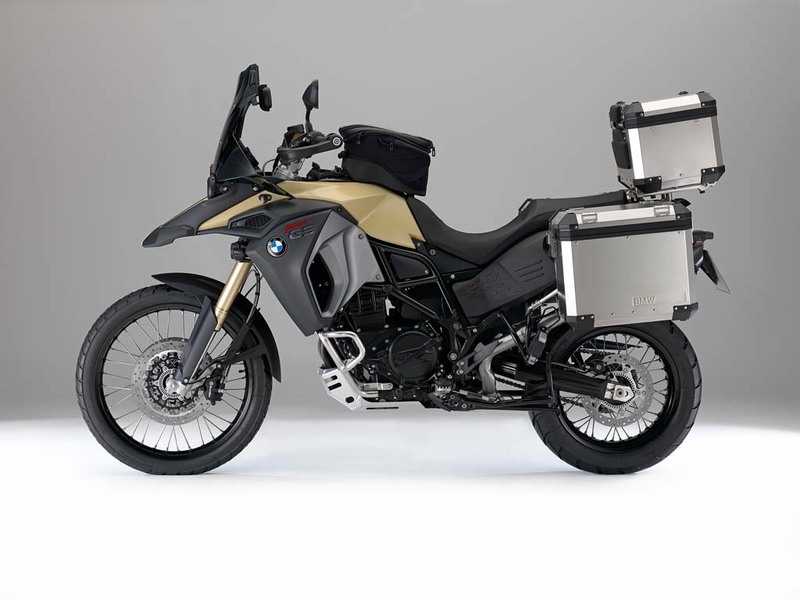 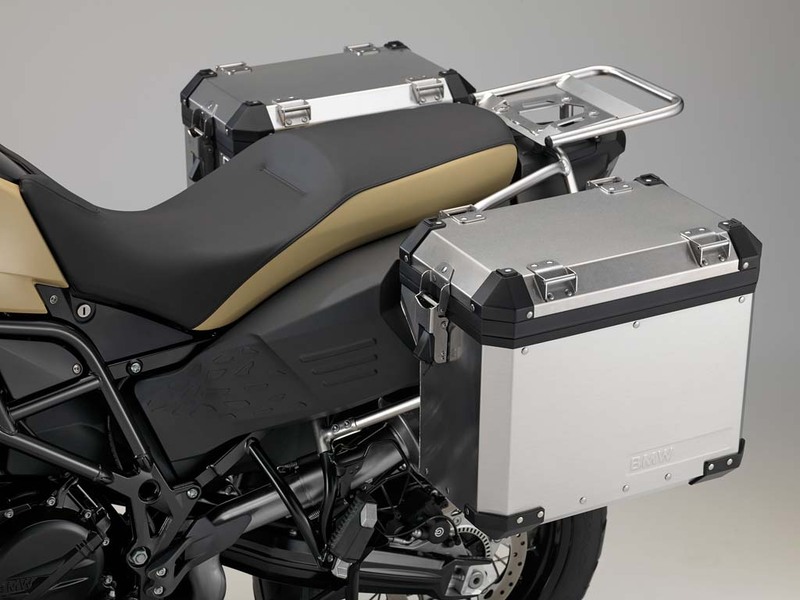 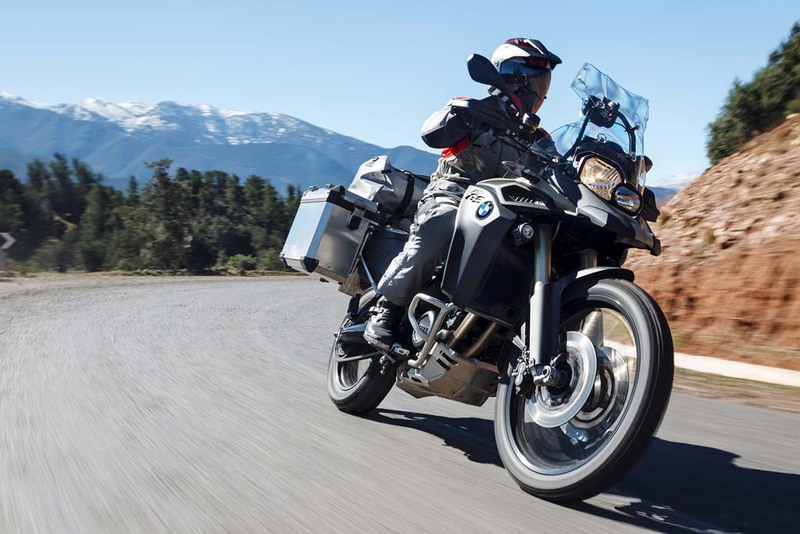 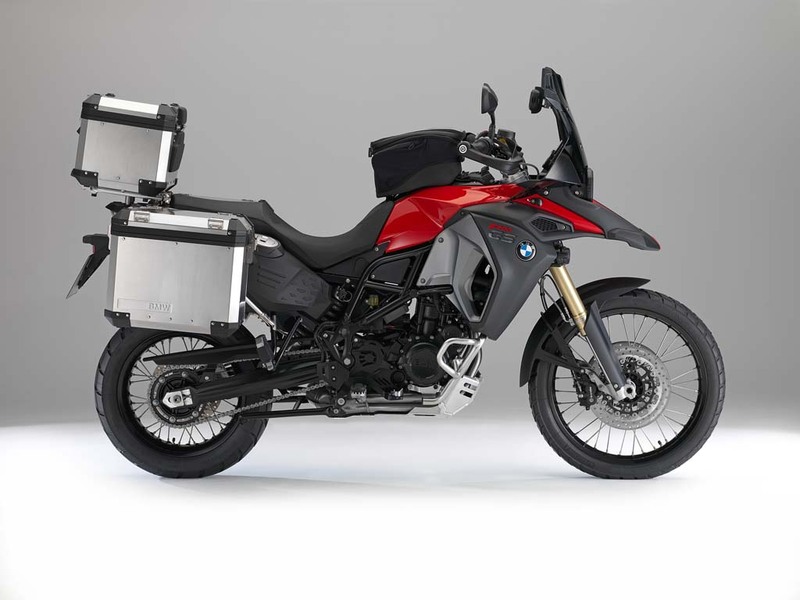 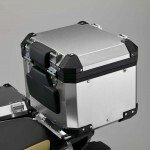 The Special package includes a set of lockable aluminum cases, a topcase holder and a newly announced BMW Motorrad Navigator Adventure GPS system.